Chris Barton is the award-winning, best-selling author of several books for children, including Shark vs. Train (Little, Brown) and The Day-Glo Brothers: The True Story of Bob and Joe Switzer’s Bright Ideas and Brand-New Colors. He lives in Austin, Texas. Don Tate is an award-winning author and illustrator of many books for children. His illustrated books include The Cart That Carried Martin and Hope's Gift (Putnam). He is also both author and illustrator of It Jes' Happened: When Bill Traylor Started to Draw (Lee & Low) as well as Poet: The Remarkable Story of George Moses Horton (Peach Tree). He lives in Austin, Texas. ♦ A tinkering African-American boy grows up to become the inventor of a very popular toy. Lonnie Johnson always tinkered with something. As a kid, he built rockets and launched them in the park amid a crowd of friends. (He even made the rocket’s fuel, which once caught fire in the kitchen. Oops.) As an adult he worked for NASA and helped to power the spacecraft Galileo as it explored Jupiter. But nothing is as memorable in the minds of kids as his most famous invention (to date): the Super-Soaker. While testing out a new cooling method for refrigerators, Johnson accidentally sprayed his entire bathroom, and the idea was born. However, the high-powered water gun was not an instant success. Barton shows the tenacity and dedication (and, sometimes, plain good timing) needed to prove ideas. From the initial blast of water that splashes the word “WHOOSH” across the page (and many pages after) to the gatefold that transforms into the Larami toy executives’ (tellingly, mostly white) reactions—“WOW!”—Tate plays up the pressurized-water imagery to the hilt. In a thoughtful author’s note, Barton explains how Johnson challenges the stereotypical white, Einstein-like vision of a scientist. A delightfully child-friendly and painfully necessary diversification of the science field. ♦ Homemade robots, space probes, pressurized water rifles—the story of African-American inventor Lonnie Johnson is tailor-made for a young audience, and Barton and Tate do it justice in this inspiring account of a man driven toward innovation against the odds. Johnson's interest in engineering blossomed at an early age, and he went on to work on NASA's Galileo project and design what would become the popular Super Soaker water gun. Barton makes clear how Johnson struggled in his unconventional line of work, and also shows the rewards of his persistence. Tate's inviting digital illustrations bring an appropriately playful air to the pages, especially in a foldout spread showing the Super Soaker's blast in all of its glory. This appealing, inspiring picture-book biography by Chris Barton (Shark vs. Train; The Amazing Age of John Roy Lynch), illustrated by Don Tate (Poet: The Remarkable Story of George Moses Horton), explores the life of Lonnie Johnson, the African American rocket scientist who invented the Super Soaker water gun... by accident. Lonnie grew up in the 1950s with five siblings "squeezed into their parents' small house in Mobile, Alabama." Forever tinkering with spare parts and junkyard scraps, he made rockets from scratch, and even built his own robot named Linex with jukebox switches and his little sister's walkie-talkie: "Lonnie used a tape recorder to program Linex, and as a bonus the reels looked like eyes." (Linex won first place for Lonnie's team at a 1968 University of Alabama science fair.) Lonnie, "a self-confident, insightful, creative thinker," went to college at Tuskegee Institute, then, as an engineer, worked for NASA's Jet Propulsion Laboratory. At NASA, he created a lightweight backup system for the Galileo space probe that photographed Jupiter and its moons. At home one day, Lonnie was working on a new refrigerator and air-conditioning cooling system, using the faucet in his bathroom sink with a hose, pump and nozzle, when "WHOOSH!" --water sprayed out with such force he decided his contraption "would make a great water gun." He approached toy company after toy company with his invention until finally, he struck gold. 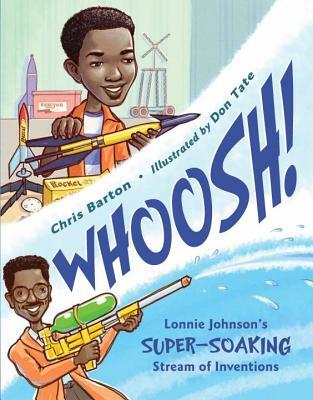 Barton's clean, lively prose and Tate's boldly composed, often comical illustrations--including a dramatic gatefold capturing the Super Soaker's mighty trajectory--make Lonnie Johnson's story of passion and persistence whoosh to life.